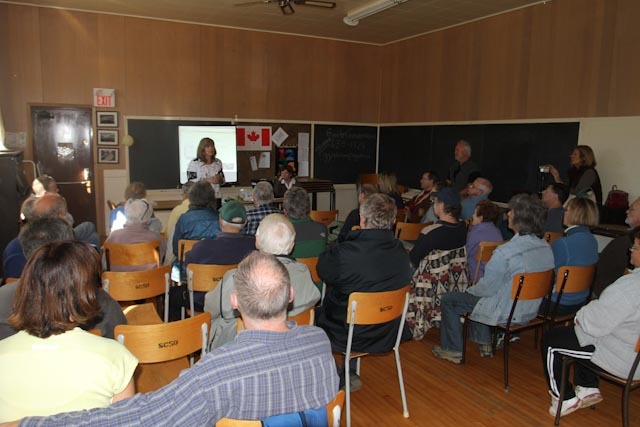 It all began back in 1962, in the current Oxtongue Lake Community Centre, when a number of concerned property owners met with the Ministry of Natural Resources, Department of Highways and Public Works, to discuss the high water levels created by, what was then, the new cement bridge at the Oxtongue Lake Narrows. The Oxtongue Lake Association (OLA) was formalized thereafter and so began our lake’s commitment to community, and protection of our environment. Since the meeting in 1962, the Association has been successful in raising awareness of issues facing our community including infamous battles to protect and maintain Ragged Falls, keeping Charcoal plants away from the community, stopping amusement parks from being established , reaching consensus on the optimal water level for the lake, and retaining our historic Community Centre. So to protect your investment, it is in your best interest to be part of the OLA. Everyone using Oxtongue Lake should be a member of the OLA, and feel an obligation to join. There is always strength in numbers and we can all benefit from the Association’s community voice and lake stewardship. Read below for a list of all the benefits and what the OLA offers. Prominent Issues the OLA has fought and WON! There is always strength in numbers and we all benefit from the Association’s community voice and lake stewardship. This means we encourage everyone to sign up to something! Best way to Protect, Promote and Preserve! Best suited for spouses and those under the age of 30. Any family member of any age welcome, but we strongly encourage them to be Members on their own. Paypal accounts encouraged, but credit cards and cash/cheque readily accepted. Many people feel that anyone using Oxtongue Lake should be a member of the OLA, and should have a community obligation to join. Having a collective voice for advocacy at the municipal township local government level, has resulted in many of the Community’s concerns being addressed including: the dump, community centre, road maintenance and snowplowing. Keeping current with cottage country related issues, and a broader collective voice at all levels of government through our paid membership in the Federation of Ontario Cottagers Association (FOCA). Supporting local initiatives such as Oxtongue Lake for Arts and Culture (OLAC) and Oxtongue Lake Facts & Fables. Having a point of contact to pose your questions and use as a resource. A central point of communication with other interest groups in the area that benefit us, including, but not limited to our Volunteer Fire Department, Oxtongue Lake Business Association, Algonquin Snowmobile Club. Discounted rates with some insurance companies, cottage life, Boatsmart etc. through our paid membership in FOCA. Coordinating the annual sponsored Regatta that is enjoyed by all. Supporting the Canada Day event. Supporting Movie Nights and other fun events. Providing opportunities to get to know our neighbours and encouraging a sense of community. Protecting our natural environment so that future generations will be able to enjoy our beautiful lakeside community. Installing navigation buoys marking underwater hazards. Maintaining an active Cottage Watch Program. Keeping you up to date on political, community, safety and environmental issues, through communications such as AGM, website, newsletters, E-blasts. Press the plus sign to find the answers! Do I need to have a cottage/home on the lake to become a Member or Booster? Absolutely not! We hope that everyone realizes that there is benefit to contributing to the Oxtongue Community. Even as a resort goer or cottage guest, you come and enjoy the personal aspects of Oxtongue and have a vested interest in preserving our community. Being a “Booster” keeps you up-to-date on all that is going on in our community and allows us to know you are there with us in spirit. We also hope that as a “Booster” you will donate and help us financially as well. What prominent Issues has the OLA fought and won? Why should I sign up to be a Member vs a Booster ? The benefits are numerous. The stronger our community voice is, the better chance we have of protecting Oxtongue Lake. Being a member ensures that not only are we financially stable, but also that we hear your voice through votes. Waiting until an issue is important to you defeats the purpose of having a committed community – we really do need you by our side the whole time so that we in turn, can be by your side too. Without the OLA, you may now be looking at a charcoal plant, or an amusement park, and not be able to visit Ragged Falls, all issues that have been successfully fought and won by OLA. We also believe fun can strengthen bonds for all ages and lay the groundwork for both current and future generations to protect our community. We hope you will take the time to read more in-depth about the OLA and all that it does and is, and that you will see it benefits your personal enjoyment and property and that membership is an investment in the future of Oxtongue. Read More about the benefits here. We have two cottages, does each cottage become a Member? We hope that each family at each cottage chooses to become a member. Membership is not tied to cottages but by the people occupying them. We have multiple generations sharing the same cottage, do we all become Members? Yes we hope that each generation becomes a member and pays the membership fee. Membership is driven by the people occupying the cottages and not by the cottages themselves. For anyone that does not decide to become a member we really encourage them to become a “Family Member”. Being a “Family Member” keeps everyone up-to-date on the events and issues facing the OLA and let’s us know that you are there in spirit. Can I change from Booster or Family Member to Full Member after signing up? Yes, you can upgrade at any time after signing up. You will have an account page that shows you your account status and an opportunity to upgrade. Please refer the Web Tips Page for specific help to upgrade your account. We are husband and wife - do we both sign up? One of you can determine to be the member and the other the Family Member, but we encourage both of you to sign up. This will ensure that you are both kept informed and that others can find you in the directory. I don't feel comfortable giving money over the internet. We understand. We utilize Paypal which is a well established, reputable company to deal with payments but if you still don’t feel comfortable the best solution is to select the Cash/Cheque option at checkout and then when we receive your cheque we will approve your status as a member. A cheque can be mailed to Oxtongue Lake Association, RR#1 Dwight, ON, P0A 1H0. How do I get reminded next year? On the anniversary date of your personal registration (if it was done manually the date we received payment and updated your status) you will receive email reminders to renew your account. You will make a payment online (or mail in manually) and your account will be active for another year. No forms will be required to fill out again (but we hope you are updating your profile information anytime changes). We know there are some of you out there that still may not have your own internet or are leery (and may not even find this question). We encourage you to try and our best solution is to reach out to us at ola@oxtonguelake.com or someone else you know to help. If you are reading this and know of someone that will need help, please offer your assistance. We are here to answer any questions you have, give you a tutorial and fill out your form for you. We also have some printable forms for you. Contact us at ola@oxtonguelake.com and we will help help you! Don’t just take it from us, let our fellow members do the talking! The OLA gives the people of Oxtongue Lake a reason to gather and pull together for the common goal of making The Oxtongue Lake Community a better place for all. It also provides an opportunity for new and existing local residents and cottagers to meet and renew old friendships. Sometimes it is the only time people get to see one another. Our family has supported the OLA for many years and considers it a privilege to be a member of this association. I commend everyone who has worked so hard for this community over the many years. Read up on the most current Directors and how they came to Oxtongue. Still unsure? You can always email any of the current directors directly or ola@oxtonguelake.com.